Teaching kids to learn phonics can be a daunting task. Kids won’t listen to you and you will soon get frustrated. Best way out is to make use of technology and get it done by those who know it best. Barbara Milne is one such early childhood teacher. Barbara Milne is a well known name and with with over 2 million CDs sold, 25 million views and 35000+ subscribers on YouTube, parents and children from all over the world have discovered the joy of learning together through sing-a-longs, games and story books created by Barbara Milne. Now Barbara Milne has her seconds iOS app available – ABC Sounds. ABC Sounds had a Lite version as well – ABC Sounds Lite, which turned out to be very popular. As per Tender Learning Concepts, ABC Sounds Lite averaged around 5000 downloads since the launch of the app 6 months back. This app now has a newer version – ABC Sounds. ABC Sounds is a priced at $1.99 and is truly awesome. ABC Sounds has lots of animation and rewards that children love! This app has been developed from Barbara Milne’s famous “Apple apple Aaa” song found on her Sounds Like Learning CD. 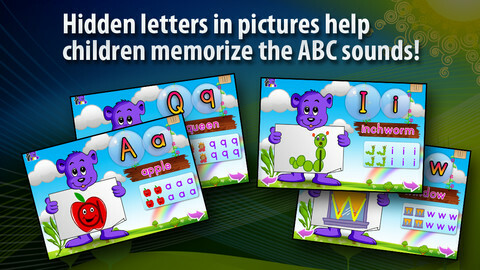 ABC Sounds uses listen and touch technique powered by the use of hidden letters in pictures to help kids memorize phonics and letters.